Some weeks ago, Shia Labeouf almost broke the evangelical internet world when he admitted he had converted to Christianity. There were two general comments from brave-behind-an-avatar warriors that stuck with me like thorns. How can he possibly claim to be a Christian when he has such a foul-mouth! A Christian? I don’t think so! Now, I don’t know Mr. Labeouf. So I don’t know if he was sincere. I hope he was, but I just don’t know. This isn’t really about him. Well, not directly. This is about assumed piety. And how it’s like a veil. You can tell it’s there, you can see it. But you never know if there’s more to it that what you see. And I’m not referring to Mr. Labeouf. I’m referring to myself, and to others who have found it easier to act Christian than be Christian. I used to want my Facebook wall to read like a devotional. But then I fell off my high horse. And when I woke up from that coma, I realized there was no way I could reflect the holiness I project on social media all the time. I may be a hypocrite, but I’m not that good. And yet, it’s getting worse. The secret is out: it’s easy to be spiritual on social media. And the more spiritual you seem, the more popular you become. In some strange way, being uber-spiritual has become the way to go. Christians who have embraced the spotlight are living the abundant life because they have the best of both worlds–they’re Christian and they’re celebrities. Well, in their own networks, at least. 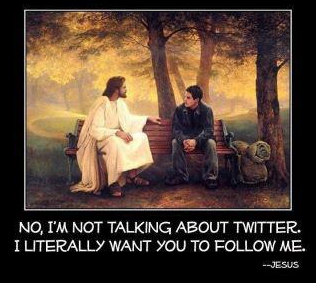 Follow a popular preacher. Your choice—pick one with the most books, the most Twitter followers, or the one with a TV show. Stalk them on social media. Share their posts. When reposting a sermon, add a short blurb to convince others you’re totally experiencing that message at that moment. And. it. is. good. Love a charity. I mean, pick a ministry. Be an unofficial spokesperson for that organization. Make sure people know you live your life according to that organization’s image. And wear their products. Share your accomplishments. And always, always, emphasize you do everything for God. Make sure it’s clear that despite the fact you’ve been talking about yourself in 140 characters or more, you really are just testifying to God’s goodness. Because you are, well, #blessed. Convict other people over their life choices by talking about how much you willingly sacrifice for God. Easy way to do it? In the summer, when other people are posting pictures of their vacations, post about your mission trip. If you’re up to it, blog about how for you it’s always about service, and never about the pleasures of this world. Watch them fall like dominoes. Thank God, publicly, for every little thing you have received. Of course you can thank Him in private, but where’s the fun in that? Why keep the blessing to yourself? So share it. And don’t forget to add how you are #highlyfavored and #deeplyloved. I wish Mr. Labeouf well. He was, after all, in Indiana Jones. And I hope all my fellow hypocrites attempt to jump a fence they’re not ready for. A fall might do them good. I know I’m grateful I did. From the Internet. Also, Jeremy Lin’s Twitter header photo.